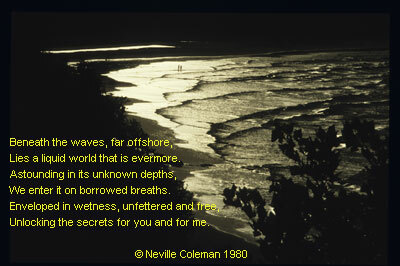 Explorer, Environmentalist, Underwater Pioneer, Photographer, Discoverer, Publisher and Friend Neville Coleman passed away on the 5th May 2012. Neville's passion for the underwater world soon rubbed-off on anyone that met him. We met during the 80's and before I knew it Neville had me working as his "Field Operative" in Western Australia and Indonesia. Reporting on dive destinations, selling his books & advertising space for his new enterprise Underwater Geographic magazine. What Neville didn't know about marine life wasn't worth knowing, he could (and would) talk endlessly about the lives of nudibranchs, shrimps, fish, crabs and molluscs. His enthusiasm was addictive and before we knew it, Neville was joining our family on dive exploration expeditions off the south coast of Western Australia, often finding new creatures that we would have simply swam over the top-of. After each dive, Neville emerged as enthusiastic as someone who had just walked on the moon. One of my family's greatest memories of Neville was in King George Sound, when we had a Southern Right Whale lift our boat from the water as it rubbed barnacles from its back. Our two kids Michael & Leanne were beside themselves, Neville as excited as ever was screaming "just take the photos - you haven't got time to cry"! All the time Neville was himself fighting back the tears as he looked towards the stern of our boat with the huge head of the whale, just an arms length away, gaping at us. The whale stayed for an hour and Neville was so excited the whole time, our kids thought he was going to wet his pants! That is how Neville lived his life, not your normal 60+ year old guy who stays at home watching TV and playing chess... no that wasn't for Neville... not on your life. Nev was still out there doing it, one day helping youngsters to ID their latest nudibranch discovery.... another running a marine naturalist course for a dive centre in some far flung corner of the world..... That is, until illness slowed him down and he had to quit diving; An illness that sadly, finally took him. But don't worry Nev, you'll be remembered...... every day when we see a nudibranch underwater, we remember you with a wide smile on our faces. You may be gone, but not forgotten. P.S. The photo of the shrimps at the top of this page is just one of many species Neville discovered and had named after him. These shrimps are known to science as Periclimenes colemani, but to divers everywhere they are simply known as Coleman Shrimps.